1 What are mirrorless cameras? 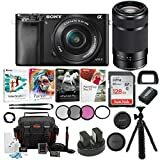 There are many different mirrorless cameras on the market, with different sizes, strengths, designs, qualities and prices. With so many options you might think that the most expensive is the best, but actually, that is not always true. Unlike DSLR cameras, mirrorless cameras obviously don’t have mirrors in the optical viewfinder, but use a digital image sensor to provide an image to electronic viewfinder that they have. Diversity of these cameras is making hard to generalize their strengths and weaknesses, but some general benefits of these cameras are that they are a lot smaller, lighter and simpler than DSLR cameras, yet they have the same sized sensor, similar lenses available and, most importantly, they can offer the same image quality. Related reading: Sony A6300 vs A6000 comparison – is it worth upgrading this great mirrorless camera? Mirrorless cameras are a way forward for those who want to move from their phone cameras but don’t want to spend a lot of money on DSLR or don’t need that bulky camera. If you don’t want to lug around your DSLR, than mirrorless camera is the best solution. They are a lot like DSLR cameras, only without mirrors and much smaller and lighter. Now that you know exactly what mirrorless cameras are, I’m going to introduce you to 5 best cameras under $500. Perfectly designed inside and out, the Nikon 1 J5 is the ultimate combination of image quality, speed, creativity, connectivity and portability. It gives us crisp and clear images and great quality video. It’s faster than any DSLR camera on the market. The controls and menu are very easy to use and the great thing is that you can send photos right in to your smart device. The only disadvantage of this camera is lack of viewfinder which can make it hard to take a photo in the bright sun, but you can brighten the output to the maximum to make it easier. It stores photos on micro SD/SDHC/SDXC memory cards. It has an amazing value for the price. It’s the best choice in my opinion (based on personal experience and hours of research). This compact camera can capture high –resolution images and full HD 1080p videos even though it fits in to a jacket pocket. This camera allows you to play with light by adjusting the ISO and shutter speed and the great thing is that you can see changes that you make to the exposure on the LCD screen (even outdoors on the bright day). Most of the mirrorless cameras have tiltable LCD screens and this one is no exception. The LCD screen (3’’ in size with 1.04 million dots) can tilt upwards up to 180 degrees, and downwards, under the body, about 45 degrees. It starts, focuses and fires in about 2.5 seconds, which is a little slow, but the quality of an image that you get compensates for the speed. One of the things that could be better is battery life. With a CIPA rating of 250 shots per charge, you might need a spare battery with you. Overall, this is a great camera for everyone from pro photographers to amateurs. If you are looking for your first compact system camera, this would be an excellent choice for you. The Sony Alpha A5000 performs like DSLR cameras which cost at least twice as much as this one. High ISO noise is very impressive. Noise from ISO 100-800 is hardly noticeable (even without noise reduction active). The A5000 has advanced exposure modes (program, aperture priority, shutter priority and manual) for less experienced photographers. It also offers 13 picture effects that can be applied to JPEG images. With built-in flash and automatic settings, you will get excellent quality images almost effortless. This camera is available in three colors: black, silver and white. The E-PL7 is not really a pocket camera, but is much easier to carry around than DSLR. It takes amazing pictures with splendid colors and sharp details. Constructed from plastic and metal with leather details, E-PL7 is compact, lightweight camera that feels solid in the hand. This camera has improved performances over its predecessors. It has very good ISO performance, but at ISO 16000 and higher image noise becomes evident. When you have good contrast light, the Olympus PEN E-PL7 is a great performer, it’s just when the camera is pushed to its limits in low light, the results aren’t that great. The LCD screen is 180 degrees tiltable, which is great for taking selfies. Cameras usually have screens that can tilt upwards, but on this one tilts under the body and gives the user the best selfie experience. With the screen that is underneath the camera selfies look better because that way you look more into the camera and not above it or on the side of it. It looks like the Olympus cares a little more about the casual crowd. 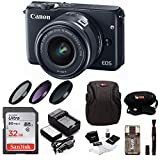 Canon EOS M10 Digital SLR Camera with EF-M 15-45mm f/3.5-6.3 is STM Lens (Bla. Lightweight and compact, interchangeable lens, mirrorless camera, Canon EOS M10, offers a lot of useful features. It has 18 MP CMOS sensor, DIGIC 6 image processor, numerous creative filters, and all at entry-level price, but it doesn’t have viewfinder. Instead, just like other cameras in this class, it offers LCD screen that can tilt up to 180 degrees upwards and about 45 degrees downwards. This camera is really easy to use, it has an ultra-simple design, but with a lot of options that it offers you can still make each picture your own style. An 18MP APS-C CMOS sensor that is paired with DIGIC 6 image processor offer us sensitivity range expandable to ISO 25600, but at ISO 1600 noise is noticeable. This camera has 3 different image quality settings available (RAW, Normal and fine) and Fine is the highest quality option. These would be my recommendations. If you decide to go for one of those cameras I really hope you will enjoy it and make a lot of great photos with it.